Upper left: Card Division, Library of Congress, Washington DC, c. early twentieth century. Unidentified photographer. Courtesy of Prints and Photographs Division, Library of Congress. ; Upper right: Cult of Mac website, May 2013. Unidentified photographer. Website operated by Cult of Mac, San Francisco, CA. ; Lower Left: Rijksmuseum Library, August 2013. Photo: Ton Nolles (via Flickr). ; Lower right: Google Data Center, Council Bluffs, Iowa, 2012. Photo: Google/Connie Zhou. Future Archive is a series consisting of the digital republication of significant but neglected twentieth-century articles on architecture, landscape, and urbanism, with each installment selected, introduced, and contextualized by a prominent scholar. The series will comprise six installments to be published in 2015. The digital revolution in publishing has resulted in a wealth of online content; left behind, however, is a rich store of material in print, which has limited cultural presence because it has limited digital presence. In line with Places' commitment to public scholarship, the series will provide a vigorous platform for sophisticated and accessible writing that has fallen out of circulation because it is not readily available electronically. 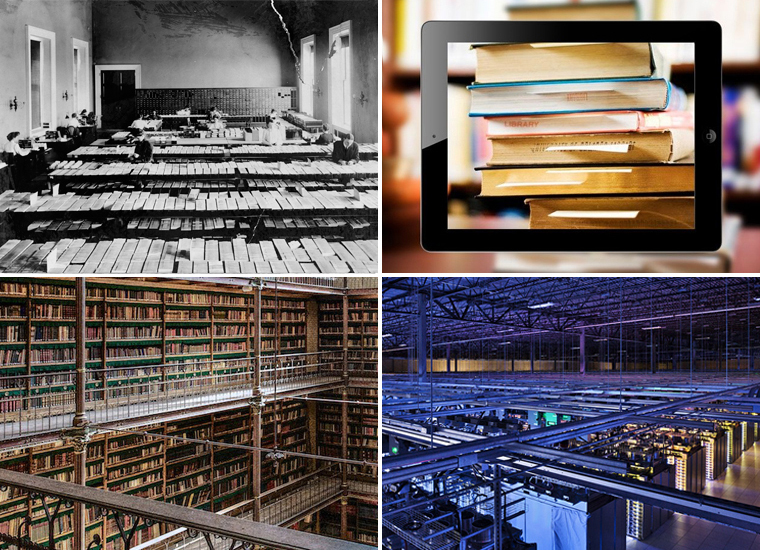 As a web-based, open-access journal, we envision Future Archive as an exciting opportunity to leverage the Internet's distributive power to strengthen cultural continuity and bring the past into dynamic conversation with the present. Nancy Levinson has been editor and executive director of Places since 2008; in that capacity she directed the journal's move from print to the web. Previously she was founding director of the Phoenix Urban Research Laboratory and professor in practice of architecture at Arizona State University, and before that cofounding editor of Harvard Design Magazine at Harvard University’s Graduate School of Design. She received a BA from Yale University and an MArch from the University of Pennsylvania. Josh Wallaert, the associate editor of Places, is a writer working with landscape as a central theme. He codirected the documentary feature Arid Lands (2007), hailed by the Chronicle of Higher Education as one of "today's best environmental films," and his short stories have appeared in TriQuarterly, Southern Review, Gettysburg Review, American Letters & Commentary, and other journals. His criticism has appeared in Places. He has an MFA in creative writing from the University of Minnesota. Keith Eggener is the Marion D. Ross Distinguished Professor of Architectural History in the History of Art and Architecture Department at University of Oregon. He is the author of the books Luis Barragán's Gardens of El Pedregal and Cemeteries (part of a US Library of Congress series), as well as many articles and chapters on Mexican and US art, architecture, landscape, and urban design. He is editor of American Architectural History: A Contemporary Reader and has been on the editorial staffs of the Buildings of the United States series and the Journal of the Society of Architectural Historians. He is a contributing editor and regular contributor to Places. Current projects include a monograph on the early-twentieth-century Kansas City architect Louis Curtiss and an essay collection on the American Midwest. Gabrielle Esperdy is associate professor of architecture at the New Jersey Institute of Technology. Her work examines the intersection of architecture, consumerism, and modernism in the urban and suburban landscape, especially in the United States in the twentieth and twenty-first centuries. She is the author of Modernizing Main Street and the forthcoming Architecture and Autopia, which examines how architectural discourse absorbed the ideals and concerns of the postwar commercial sphere. Esperdy is an associate editor of multi-volume series Buildings of the United States and editor of the online SAH Archipedia. Sandy Isenstadt is associate professor and director of graduate studies in the Art History Department at the University of Delaware; he also codirects the Center for Material Culture Studies. Isenstadt focuses on modern architecture, concentrating on Europe and the United States, but comprising also the global spread of modernism. His books include The Modern American House: Spaciousness and Middle-Class Identity and the anthology Modernism and the Middle East: Politics of the Built Environment. His current projects range from Electric Modernism, a study of the cultural reception of electric lighting, to The Rise and Fall of Modern Shopping, a short book on shopping infrastructure from the Renaissance through today. Barbara Penner is senior lecturer in architectural history at the Bartlett, University College London. Her interdisciplinary research explores the intersections of public space, architecture, and private lives. Her books include Bathroom, a cultural history of the toilet and sanitation, and Newlyweds on Tour: Honeymooning in Nineteenth-Century America. She is coeditor of the anthologies Ladies and Gents: Public Toilets and Gender and Gender Space Architecture. Simon Sadler is professor of architectural and urban history and Chancellor's Fellow at the University of California, Davis. His current research centers on countercultural design, the legacies of the late avant-garde, and the ways in which design is employed to model complicated concerns and processes. He has written widely on the ideological history of late-twentieth-century vanguard architecture; his books include Archigram: Architecture without Architecture, Non-Plan: Essays on Freedom, Participation, and Change in Modern Architecture and Urbanism (coedited with Jonathan Hughes), and The Situationist City. His upcoming book, written in collaboration with Caroline Maniaque-Benton, is a documentary history of the activist uses of architectural and environmental design from the 1960s to the present. Despina Stratigakos is associate professor of architecture at the University of Buffalo, State University of New York. Her overarching focus is gender and modernity in European cities. She is the author of A Woman's Berlin: Building the Modern City, a history of Imperial Berlin, and winner of the German Studies Association DAAD Book Prize and the Milka Bliznakov Prize. Stratigakos has also published widely on issues of diversity. In 2007, she curated an exhibition on Architect Barbie at the University of Michigan, and in 2011, collaborated with Mattel on the development and launch of the doll in the Barbie I Can Be series. Her upcoming book Hitler at Home investigates the architectural and ideological construction of the Führer's domesticity. Places Journal is an interdisciplinary journal of contemporary architecture, landscape, and urbanism, focusing particularly on the public realm as both physical place and social ideal. We are dedicated to advancing public awareness of the expansive value of design thinking and practice with the goal of promoting sustainable cities, innovative architecture, and healthy landscapes. Places was founded as a print journal in 1983 by faculty at MIT and Berkeley, and moved entirely online in 2009.